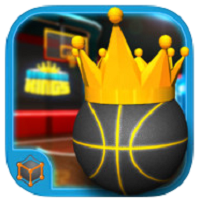 Basketball Kings from Mobile Craft is a game for basketball fanatics, and if you have ever felt the urge to hit big game winning shots like LeBron James, then Basketball Kings is just the game for you. It’s got plenty of action and it’s very addictive. Basketball Kings is a swipe and shoot game where your skills at hitting jump shots will be tried in different challenges. The key is the swiping motion used for shooting the ball, and it’s a good choice since there’s a natural feel for it. If you want to score as many baskets as you can, you need to make sure that your shots are smooth and consistent. If you make consecutive shots or hit nothing but net, you get rewarded bonuses, adding incentive to play. Furthermore, the graphics on the game is one of the crispest you’ll see on mobile today. The sounds are also very good and add to the atmosphere and make it more engaging. A good basketball game will offer you plenty of options, and Basketball Kings does not disappoint in this regard. The online mode is a lot of fun as it allows you to play hoops against other players in real time. But that’s not the only option as there are individual shooting challenges that will test your prowess. Other modes are Arcade, Single Ball, Time Attack, and Tournament, which goes to show how versatile this game is. So if you’re looking for a good basketball game, then Basketball Kings is the one to get.